February 6, 2019 – The Pittsburgh Business Times met with CEO Helen Hanna Casey, and President of the PA Region Tom Ceponis, prior to the PA Awards Event yesterday. “Howard Hanna Real Estate Services kept growing in 2018 in territory, agents and dollar volume in a regional and national real estate market that continues to be constrained by limited inventory. The family-owned real estate company, the region’s largest and the third largest in the country, offered its annual sales benchmarks amid its company award season, hosting 2,000 agents from throughout Pennsylvania at the David L. Lawrence Convention Center. The company has similar events scheduled for Ohio and other divisions in what’s grown to a nine-state territory for Howard Hanna. Overall the company closed on a total volume of more than $23.6 billion in transactions in 2018, including both in-house and franchise deals. The company closed on a total of 112,448 units sold. The company is rolling out a host of new programs as it works to stand out in a crowded market for residential services. That includes a new “green penguin” marketing program that motivated Howard W. “Hoby” Hanna, IV, the president of real estate brokerage to speak before the audience of agents in a penguin costume. To read the article in its entirety click on this link: www.bizjournals.com/pittsburgh/news/2019/02/06/howard-hanna-works-to-bolster-growth Note: You must be a subscriber to the Pittsburgh Business Times to access the article. 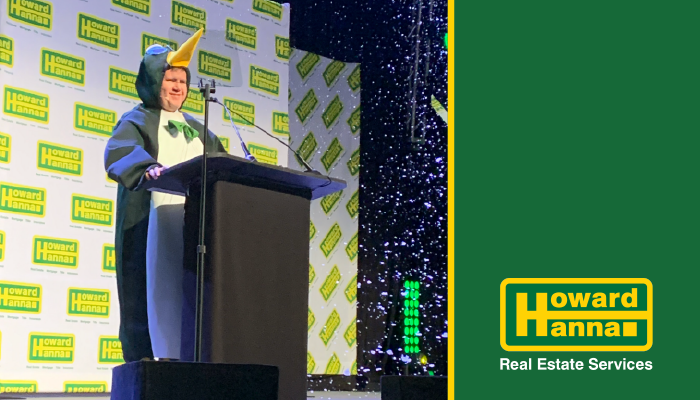 Photo: Howard W. “Hoby” Hanna, IV, the president of real estate brokerage for Howard Hanna Real Estate Services, dressed up in a penguin suit in speaking before upwards of 2,000 of the company’s agents at an awards event for Pennsylvania at the David L. Lawrence Convention Center. An amazing family and company. I’m proud to have gotten my real estate license and to be part of Howard Hanna!